The Predators held a lead three different times, but it was not enough as they lost 5-4 in overtime in Chicago. Patric Hornqvist extended his goal streak with a pair of tallies, while Patrick Kane burned the Preds once again with two goals of his own. Viktor Stalberg scored the game-winner for the Blackhawks in overtime. To the Predators’ credit, they fought hard to get a point out of this game. They were shorthanded physically and spent a lot of time, well, shorthanded. The Preds’ penalty kill survived seven Blackhawks power plays, including a pair of 5-on-3’s with key players in the box. Additionally, the Preds’ man advantage was 1-for-3 tonight thanks to Hornqvist’s late second period goal. Nashville, Tenn. (October 31, 2011) – Nashville Predators President of Hockey Operations/General Manager David Poile announced today that the club has recalled forward Ryan Thang from Milwaukee (AHL), and placed forward Nick Spaling on injured reserve. Thang, 24 (5/11/87), leads the Admirals in goals (5) and is tied for third in the AHL in plus/minus rating (+8). In his second professional season, the third-round selection (81st overall) in the 2007 Entry Draft also ranks third on Milwaukee with six points in seven games. The Chicago native is expected to make his NHL debut tonight against the Blackhawks at the United Center (7:30 p.m. on FOX Sports Tennessee and 102.5 The Game). Monday’s game at Chicago is the first of five on the road for the Predators, who head to Phoenix, then California later this week. The club’s next home game will also be the 1,000th regular-season game in franchise history on Nov. 12 against the Montreal Canadiens (6 p.m. CT). Tickets are still available for the Montreal game, as well as for rare visits by the Washington Capitals (Nov. 15) and Toronto Maple Leafs (Nov. 17). To purchase tickets, visit nashvillepredators.com, ticketmaster.com or call 615-770-PUCK (7825). In a shrewd move, Tim Hortons has put their name on the 2012 NHL All-Star game by becoming the title sponsor. With most teams around the NHL hitting the ten game mark, many folks are making an assessment of where things stand around the league and with individual teams. The Nashville Predators have compiled a respectable 5-4-1 record and have played better in the last week, picking up back to back home wins against the Lightning and the Ducks. Coach Barry Trotz was asked what he thought about the first ten games after Saturday's contest. "We're still growing and we are still trying to find our identity. A game like this will help us find our identity. We had to come together tonight not only from a physical standpoint but ten of our first 15 games are on the road so we wanted to establish some home ice dominance and that was a step in the right direction. This week, we actually played very well at home. I really believe we should have had a point against San Jose earlier in the week. We got four points and I really felt we should have had five. That's a step in the right direction." Here is a look back at the Predators' record in the first ten games and how they ended the season. From looking at the chart, there is no direct correlation to the team's record in the first ten games and the overall finish, but there are some interesting items in specific years. In 2000-2001, which was the most successful season of the first five, the team had the only winning record during that era in the first ten games. In the first year that the Preds made the playoffs in 2003-2004, the start wasn't anything special but the team started a 10-2 run on November 8 in their 14th game that pretty much launched them into the postseason. The team's best start came out of the lockout in 2005-2006 when they won the first eight games and got a point in game nine in Columbus. They continued to stay hot and were 24-7-3 through 34 games. They cooled down after that point, going 25-18-5 for the rest of the season. The following year, when they totaled 110 points, the Preds opened the season with three straight losses before going on a 13-2-3 run. They played they worst hockey of the year at the end of the season when they finished 5-5-2. The start to the 2007-2008 season included a six game losing streak beginning in the third game. In the one season in the last seven that the Predators did not make the postseason in 2008-2009, there was nothing in the team's 5-4-1 start to indicate that they would not continue to make the playoffs. The 3-6-1 start the following year was cause for concern for Predator fans and included a six game losing streak that was finally broken in a thrilling 6-5 overtime win in Ottawa. Last season was a memorable start for the team as they were the last team in the NHL that did not have a regulation loss when they started 5-0-3 behind rookie goaltender Anders Lindback. In conclusion, it is hard to predict the where the team will end up in April based on the opening ten games of the year, but the nuances of the individual years have been interesting at times. The Predators will begin a five game road trip tonight in Chicago at 7:30 p.m. in a game that will be televised on Fox Sports Tennessee. In tonight’s 3-0 win over the Anaheim Ducks, Predators goaltender Pekka Rinne set two personal records. Rinne won his 100th game in net for the Preds, as well as took over the top spot for career shutouts in team history. “It’s an honor,” said Rinne, who made 20 saves on the night. “There have been some good goalies in this organization, but it just says I’ve been playing with some good teammates and successful teams. Personally, to have those shutouts, it feels great. Even though it’s an individual statistic, I feel it’s a team effort and says how good of a team we’ve had in the three seasons since I’ve been here. Rinne broke Tomas Vokoun’s all-time mark of 21 shutouts in a Predators uniform. Also, the Kempele, Finland, native became the second Predators goalie to reach the 100-win plateau (Vokoun leads with 161). Tonight's video is courtesy of the Nashville Predators as I am sitting on the balcony listening to the surf in Cocoa Beach, Florida. The recently invigorated Nashville Predators will meet the Anaheim Ducks tonight at Bridgestone Arena in the two teams' first meeting since last year's first round playoff series that was filled with bitterness and animosity. Predator fans, who have clear memories of Corey Perry spearing Pekka Rinne in the gut with his stick and Bobby Ryan stomping Blake Geoffrion's foot, should be in top form for tonight's contest. The Predators have been inconsistent in their first nine games but had their best effort of the year on Thursday when they beat the Tampa Bay Lightning 5-3 behind Mike Fisher's three-point effort. The Ducks have been streaky, winning four in a row and then losing three straight before a 3-2 victory over Minnesota on Thursday. The Ducks' top line of Ryan Getzlaf, Perry, and Ryan was split up prior to the last game to try to break the losing streak but could be reunited tonight. Teemu Selanne is the Ducks' career scoring leader against the Predators with 23 goals and 27 assists. Both the Preds and the Ducks have suffered from a lack of scoring with Nashville scoring 2.3 goals per game and Anaheim averaging 2.2. Both teams have also had low shot counts with the Preds having an anemic 22.4 shots per game average while the Ducks have managed 26.9. The biggest difference between the Ducks' team that the Predators faced in the playoffs and this year's version will be seeing Jonas Hiller (4-3-1, 2.49, .905) in net instead of the tandem of Ray Emery and ex-Pred Dan Ellis (1-0-0, 1.33, .966). Hiller missed the playoffs last season with dizziness but appears to be in good shape this season. Pekka Rinne (4-4-1, 2.51, .924) should be in goal for the Predators with Anders Lindback (0-0-0, 1.50, .958) continuing to get plenty of time watching from the best seat in the house. A win tonight would be Rinne's 100th career victory for the Predators. He is currently the league leader in shots faced (278) and saves (257) while playing 502:19 minutes. Sergei Kostitsyn was nicked up a bit in the last game but is expected to play tonight. The Predators are also hopeful of getting Marty Erat back in the lineup after he missed the last eight games with an upper-body injury. Cal O'Reilly was sent to Phoenix on Friday to open a roster spot for Erat's return. There will be plenty of pre-game activities before the 7 p.m. puck drop with the Preds celebrating Halloween a couple of days early as fans are being encouraged to dress in costumes. The Predators will travel to Chicago on Sunday for a Monday meeting with the Blackhawks and then will head west for and not play at home again until they celebrate their 1000th game against the Montreal Canadiens on November 12. This weeks edition of Smashville on the Glass Radio features an interview with Peter Horachek and an extended round-table discussion with Mark Willoughby from The View from 111. During the show we had a discussion of Mattias Ekholm's future with the Predators, a look at Saturday's game with the Anaheim Ducks, and plenty of other topics. The Nashville Predators sent Cal O'Reilly to the Phoenix Coyotes in exchange for a fourth round pick at the 2012 NHL Entry Draft next June in Pittsburgh. O'Reilly must pass a physical to officially complete the trade. It would seem that his move was done with the expectation that Marty Erat will come off of the injured reserve list soon and the Predators were at the 23 man roster maximum. The Nashville Predators invite you, your friends, and your family to celebrate Halloween two days early on Saturday at the Bridgestone Arena when the Predators play the Anaheim Ducks in a rematch of last year's first round playoff series. Predator fans everywhere breathed a sigh of relief and celebrated the Predators' first win on home ice in over six months on Thursday night when they beat the Tampa Bay Lightning 5-3 in front of a near capacity crowd at Bridgestone Arena. There were many heroes in a game that looked like "Predator hockey" for the first time at home this season. The Preds were out-shot by their opponent for the ninth game in a row but it looked different since they were putting plenty of pressure on the Lightning for the entire game and were able to contain the Bolts' push in the final period. It is amazing how much better the team playes with Mike Fisher and Francis Bouillon inserted into the line-up. Craig Smith has blossomed being on the Fisher line as the two appear to perfectly complement each other's game. Bouillon has solidified the defense and spent most of the night paired with Kevin Klein on the second line. Jack Hillen had his best game as a Predator and seemed to do well with his new pairing with Jon Blum. The Nashville Predators 5-3 win over Tampa Bay on Thursday night at Bridgestone Arena was a long time coming and involved several firsts for the team and individuals. For the team, it was the Predators' first win in their new gold sweaters and the first in seven games at home, dating back to game six against Anaheim in last year's opening round playoff series. Individually, Mike Fisher got his first (and second) goal of the year in his second game back from offseason surgery. Patric Hornqvist got his first goal after suffering through the Preds' first eight games with no markers after having 21 last season and 30 the year before. A third player that scored their first goal of the year was Nick Spaling. Pekka Rinne was outstanding in goal, stopping 29 of 32 Tampa shots and making numerous highlight reel-type saves from odd angles. It will be a big night in Smashville with the Predators facing a crucial NHL contest while the real world is facing the battle with cancer. At Tuesday night's game, I sat with a good friend, Mark Manning, who is a Tampa Bay Lightning season ticket holder and a recent cancer survivor. He was here a couple of days early and missed seeing his Lightning play and celebrating with the other cancer survivors. When I first saw him on the plaza, he told me how happy he was to see me and it was a greeting like I had never felt before. He was happy to be alive to see me, which is different than the normal casual greeting. It was something that has stayed with me ever since. He explained the ordeal that he had been through and the work that the doctors did in a nine hour surgery that he underwent almost a year ago to remove his cancerous thyroid gland. He truly is happy to be back out and about and enjoying every day. Seeing Mark reminded me of the special meaning of tonight's celebration and made me happy to be alive and relatively healthy too. There are few people anywhere who have not been touched by cancer. I lost two parents to cancer and saw how they suffered in their final days. Thanks to the NHL and the Nashville Predators for their support in finding a cure. Here is all the information on Hockey Fights Cancer at tonight's game as well as our game preview from earlier today. Other previews come from Ryan Porth, Amanda DiPaolo, Robby Stanley, Dirk Hoag, Preds.com, and The Tennessean. Smashville 24/7 also has the Morning Skate. News from Tampa can be found at Tampa Bay Online, TampaBay.com, Beasts of the Southeast, Lightning Strikes, Bolts Report, Raw Charge, Lightning Hockey Blog, Don't Trade Vinny, Bolts By The Bay, Bolt Prospects, and Hockey Bay Blog Wars. Here are the game notes from NHL Media Services. Go here for discount tickets for tonight's game and use the offer code preds. The Nashville Predators and the Tampa Bay Lightning will square off at Bridgestone Arena tonight at 7 p.m. CDT for the annual Hockey Fights Cancer celebration. The two squads have opposite records over the last five games with the Preds going 1-3-1 and the Bolts going 3-1-1, winning their last three games. Tampa won a spirited contest 4-3 in Buffalo on Tuesday while the Predators lost late 3-1 against San Jose at home. The Predators are still looking for their first win on home ice this season as they have lost all three contests. Including last year's playoffs, they have lost six in a row at Bridgestone with their last celebration coming in game six of the first round against Anaheim in April. This will be the only meeting between the two teams this season. The Lightning have only visited Nashville nine times and only three times in the last seven years. The Preds have a 5-7-3 record against the Bolts and are 3-4-1 at home. The Nashville Predators are always in the forefront in the fight against cancer. On Thursday, they will hold the annual Hockey Fights Cancer Night at Bridgestone Arena at the game between the Predators and the Tampa Bay Lightning. The team will wear special Hockey Fights Cancer jerseys during the pre-skate that will be auctioned off to benefit the Monroe Carell Jr. Children’s Hospital at Vanderbilt. It was good to see Mike Fisher and Francis Bouillon back on the ice last night. Both looked good and showed few signs of rust. Fisher actually was second in minutes played behind Craig Smith, who he was paired with for most of the night. Even though the Predators lost, there were positive signs that the team is headed in the right direction. It was pretty amazing that putting Fisher into the lineup made all the lines look much stronger. Bouillon cemented the Preds third defensive pair and we did not see the problems presented in prior games from that unit. Pekka Rinne was solid in net and as usual and was ready to shelter the blame for the two fluky goals that he allowed. The key, going forward, is for the Predators to solve their lack of offense problem, and at a minimum, put more shots on net. At some point, Rinne and the defense will start squeezing the stick so hard trying to be perfect that they will become ineffective. The Nashville Predators head back to the drawing board at Centennial Sportsplex this morning to try to find more answers to their lagging offense. In the Preds' history, they have always been a team that found ways to win in spite of short-comings but this year's version has yet to find that knack. With the exception of the Vancouver loss, the team has not been bad, and in fact has done some positive things that have looked better than past years in certain stretches. The power play has been a mixed bag with crisp passing and good pressure at times and complete breakdowns at other times like on the Sharks first goal last night. It is certainly not time to panic, but more consistency is needed sooner than later. Our Morning After Round-Up will be up shortly with more on last night's game. The Nashville Predators returned to the Bridgestone Arena on Tuesday night and continued their early season frustrations with a 3-1 loss to San Jose. The Preds continued their season-long streak of being out-shot by the opponent with the Sharks putting the puck on net 36 times to the Predators' 20. Pekka Rinne was solid in net, making 33 saves, but was victimized by a couple of loose pucks around the net. A very remorseful Rinne explained, "When you lose a game, you don't care about the saves, you care about the results and tonight obviously, there are a couple of pucks that I would like to take back but it's hockey." The first goal by Logan Couture at 14:22 in the opening period was short-handed, off of a rebound on a shot from Martin Havlat that bounced funny and slipped from Rinne's grasp. "I gave up a rebound and before you know it, it's in the back of the net. That's the way it goes." The Nashville Predators are following a familiar early season path, trying to learn what kind of team they are. It has been hard to tell to this point since there have been so many regulars absent from the lineup. The hope is that Mike Fisher and Francis Bouillon will return tonight or later this week to bring a stabilizing veteran presence to the youthful line-up. Both will be trying to catch the proverbial "moving train" that Barry Trotz likes to discuss but it has to start somewhere. The Sharks always have an exciting team and added Brent Burns, Martin Havlat, and Michal Handzus to their already powerful line-up. Puck drop will be shortly after 7 p.m. CDT and the game will be broadcast on Fox Sports Tennessee. Discount tickets are still available by going here and using the offer code Preds. Here is our preview for tonight's game from earlier today. Other previews come from Amanda DiPaolo, Ryan Porth, Robby Stanley, Lady Preds, The Tennessean, and Preds.com. For all the news from San Jose, check out Mercury News, David Pollak, SF Gate, Fear the Fin, Chat Sharks, SharksPage, Battle of California, The Chum Bucket, Blades of Teal, Couch Tart, and Dudes On Hockey. If you are in San Jose, the official viewing party will be at the El Toro Brewing Company. Here are the game notes from NHL Media Services for tonight's contest. After salvaging a win in Calgary on Saturday to even the season record at 3-3-1, the Nashville Predators return to Bridgestone Arena tonight to face the San Jose Sharks (3-3-0). The Predators have been inconsistent in their first seven contests and have been out-shot by an average of 34 to 22. The team has already lost 24 man-games due to injury with Marty Erat on injured reserve and Cal O'Reilly not being at full speed. The good news is that two veteran players who have not played this season, may be available for tonight's contest. Mike Fisher Tweeted that he has been cleared to play and Francis Bouillon was also seeking final medical clearance to return from a January concussion. After a frustrating start for players, coaches, and fans, the Nashville Predators return home this week with a 3-3-1 record and basically a no harm, no fowl position in the standings. All are hoping to recapture their magic and move in a positive direction. The first seven games have not been pretty but they have been played with key players out and others hobbled. Pekka Rinne was back in Vezina form behind an improved, but not great, defensive effort on Saturday when he tied Tomas Vokoun's career shutout record with the Predators. Today starts a new week and a new life for a team that has sent an unhappy player to Europe and hopes to have a few true "Predator way" guys back in the fold and on the bench in the near future. Slow starts have not been uncommon for successful Predator teams in the past. David Poile confidently stated that this year's team would be better in the second half than in the first half. The team is still young and will mature over the next couple of months. The keys will be to get a little better every game and putting more pucks on net. This week the Predators will face three playoff teams from last season in San Jose, Tampa Bay, and Anaheim, who will be out to revenge their first round loss to the Preds last Spring. Go here for discount tickets to all three games. The Nashville Predators beat the Calgary Flames 2-0 at the Scotiabank Saddledome on Saturday afternoon in a game that did not solve any of the Preds' recent offensive woes but did produce a better showing on defense. Pekka Rinne had his first shutout of the season, stopping all 33 Calgary shots. It was Rinne's 21st career shutout, tying him with Tomas Vokoun on the all-time Predator list. The offense was supplied on a freak goal by Niclas Bergfors as well as a late goal by Sergei Kostitsyn. Miikka Kiprusoff took the loss even though he was rarely challenged by the Preds who only mustered 14 shots, including only two in the final period. The Predators evened their record at 3-3-1 and broke their four game losing streak. They were 1-2 on the three game road trip to Western Canada. The Predators returned to Nashville after the game where they will face the San Jose Sharks on Tuesday at the Bridgestone Arena. This week, we were pleased to have Nashville Predators' goalie coach Mitch Korn and Kent Wilson from FlamesNation on as our weekly guests. Ryan's interview with Korn is outstanding as he explains the ins and out of what he does with the Preds' goalies. He also talks about all the goalies in the Preds' system as well as some past netminders. Kent joined us to give the Calgary side of today's game between the Nashville Predators and the Flames and also let us know what the mood was like Calgary. The show concludes with Ryan and I accessing the current situation with the Preds. Make the jump to listen on the player or go to BlogTalkRadio or iTunes to download. The Nashville Predators headed west last Sunday with hopes of a team-building road trip that would solidify the squad and bring home a few points in the standings. After two games, the team appeared frustrated and fractured with zero points to show for the effort. The frustration level peaked during the third period in Vancouver on Thursday night when Shea Weber and Ryan Suter both ended up in the penalty box with senseless penalties born out of frustration in the 5-1 loss. The Nashville Predators announced that they have assigned Mattias Ekholm to Brynas IF of the Elitserien (Swedish Elite League). It is not surprising that Mattias Ekholm has been removed from the Nashville Predators roster after Coach Barry Trotz raked him over the coals after Thursday's 5-1 loss in Vancouver. It is very troubling that he chose to go to Europe instead of accepting an assignment to Milwaukee of the AHL. Before the season started David Poile explained that it was very important for the young defenseman to play in North America this season. He indicated that if he returned to Europe's larger rink and style of play that he would face the same challenges in camp next season and possibly be no more NHL ready than he is today. Is it possible that Ekholm has played the only two games that he will ever play in Nashville, or even the NHL? It's something that has to be considered, especially since this choice does not fit the mold of "The Predator Way." Jim Diamond provided the initial news that Shea Weber will not be suspended but will be fined $2500 for his hit on Jannik Hansen on Thursday night. There is no word as to whether he will be considered a repeat offender going forward. Here is Diamond's full story from Calgary with reaction from those involved. The hit on Jannik Hansen occurred on Thursday night at 5:12 in the third period in the Preds 5-1 loss Vancouver. Hansen received a bloody nose but was able to return to the game. She Weber was reported to have an early afternoon hearing with Brendan Shanahan to discuss his hit on Jannik Hansen at 5:12 in the third period of Nashville's 5-1 loss in Vancouver. Our best bet is a couple of games based on what we have seen handed out on Shanny TV earlier this year. Weber is not a prior offender which is to his advantage, but the play appeared to be one of frustration more than being a hockey play. He will be very lucky if he only receives a fine. Here is the video of the hit from several angles. In the offseason and the preseason, David Poile gambled that the Predators had the right people in place to continue the Nashville Predators' run to the Stanley Cup. In true Predator fashion, he molded a team with rookies and outcasts added to the core and waited to see how things developed. During the preseason, a 7-1 record looked like the gamble was paying off. It is not quite as clear in the Predators' 2-3-1 start to the season. Granted, until Mike Fisher and Francis Bouillon are inserted into the lineup, we will not have seen the real team. However, after last night's performance, there are several players teetering on the brink of seeing time in Milwaukee or elsewhere. Poile has the budget to go elsewhere, if needed, to find additional players if that is the route that he chooses to go. Saturday's game against Calgary may be the last chance for a few players to prove that they deserve time on an NHL roster. The Nashville Predators' frustration may have reached the boiling point in the third period of last night's 5-1 loss to Vancouver when Ryan Suter and Shea Weber had time to chat in the penalty box about the concurrent penalties that they were serving. Unfortunately, Weber's was a double minor when he was charged with boarding Jannik Hansen with an unsportsmanlike conduct added for good measure. After watching several weeks of Shanny TV, I've seen lesser hits result in suspensions. Luckily, Weber is not considered a "repeat" offender. Weber played on the edge several times last season and he never had to pay. Continued undisciplined play like last night will eventually cost him games. I, personally, would say that it is chance that this play will be reviewed or possibly, a fine could be levied. Irregardless, what was seen last night was not "Predator Hockey" and David Poile and Barry Trotz will not stand for much more of that type of game in the future. As Seth Lake pointed out, after the 4-1 deficit at the end of the first period, the guys on the ice were playing for roster spots when changes will be made when Mike Fisher and Francis Bouillon return in a few days. Both the Vancouver Canucks and the Nashville Predators limped in to Thursday night's contest looking for a cure for the early season "hangover." One team found a cure and the other took the brunt of it. Vancouver easily won the postseason rematch 5-1 after taking an early 4-1 lead in the opening period. All the usual suspects and a rookie scored for Vancouver as goals came from Daniel Sedin, Henrik Sedin, Dale Weise, Chris Higgins, and Ryan Kesler. Matt Halischuk had the lone goal for the Preds. Pekka Rinne left after the first period after he was victimized by a porous Predator defense. Anders Lindback relieved and should have received "star of the game" honors, stopping 23 of 24 shots during the Canucks' assault in the final two periods. Roberto Luongo was rarely challenged in taking the win as he stopped all but one of 26 Predator shots. After the game, the Predators tucked their tales and fled to the airport where they will fly to Calgary and face the Flames at 3 p.m. on Saturday before returning to Nashville. The Predators return to Vancouver tonight for the first time since last year's memorable second round series that was a magical time for the Canucks' Ryan Kesler. Here is a story that we did after the series was over with several Predator players discussing Kesler's play. On the other side of the coin, Kesler was equally complementary of the Predators when we spoke with him in Las Vegas at the NHL Awards in June. Here is our game preview from earlier today. Other Predator Previews come from Ryan Porth, Amanda DiPaolo, The Tennessean, David Boclair, Dirk Hoag, Paul McCann, Jeremy Gover, Predatorial, and Predators.com. For Canucks news check out The Province, Vancouver Sun, FaceOff, Globe and Mail, CBC, Nucks Misconduct, Pucked In The Head, Pass It To Bulis, Canucks Hockey Blog, Canucks Corner, The Canuck Way, Canucks FanZone, Love Our Canucks, Head to the Net, Canucks and Beyond, Canucks Army, Play Me That Ballard, Benched Whale, and 3:10 to Overtime. Here are the NHL game notes for tonight's game. Preds at Canucks: Which Team Has the Hangover? It is hard to tell which of the two teams set to meet tonight at Rogers Arena is coming off a Stanley Cup playoff hangover. The Nashville Predators have been inconsistent and have been all over the place accumulating five points with a 2-2-1 record. The Vancouver Canucks have played one more game and also have five points with a 2-3-1 record. The Predators appeared to have reached rock bottom (so far) in Edmonton on Monday night when they only managed twelve shots in a 3-1 loss to the Oilers. More than one player described the effort as "embarrassing." The Bridgestone Arena Continues to be one of the most visited facilities in the world as it ranked 12th in the world and fourth in North America in the latest Pollstar attendance rankings (complete list here). This weeks edition of RLD Hockey Talk features ex-Calgary Flames GM Craig Button who now works as a TV analyst for TSN and the NHL Network. Craig gives his take on current events in the NHL and reveals that he would indeed, like to return to a General Manager position at some point in the future. This was one of our more insightful shows as Button shares how GMs look at things as the put their team together and move through the season. Ryan and I cover a few other things and probably are pushing our luck with a negative look at the Columbus Blue Jackets and their goalie, Steve Mason's horrible start. The Nashville Predators woke up in Vancouver this morning (literally) and Pred fans are hoping that they will wake up (figuratively) tomorrow night when they face the Canucks for the first time since last year's second round playoff series. Inconsistency is probably a nice way to describe the Predators 2-2-1 start to the season. After wins in their first two games, they have now lost three in a row with the worst game, by far, coming Monday in Edmonton when they only had 12 shots on goal in a lackluster 3-1 loss. Pekka Rinne has been the star of the year so far as he has battled an average of 34 shots per game while the Preds have only produced 23 shots per game. Scoring, especially during five on five play, has been non-existent with the Preds scoring five of their twelve goals in special team situations. Being this early in the season, it is not time to panic, but improvements (and a few wins) need to come quickly. Hopefully, a return to Rogers Arena for practice today will fuel the fires that are needed to set the team in the right direction. After a dismal showing last night in Edmonton, the team will return to the scene of the crime this morning for practice at Rexall Place looking for the magic that they had just a short time ago when they won eight games in a row during the preseason and opening weekend of the regular season. After practice, they will fly to Vancouver where it won't get any easier against the Canucks who they last saw during the second round of last year's Stanley Cup playoffs. It will be a challenge to force a quick turn-around but half the battle is won since it appears that the whole team understands that there is a problem. It will be interesting to see how they look in Thursday night's game against the Canucks. Here are our gems from the couch last night and the Morning After Round-up from this morning. There were few positives to take away from last night's loss in Edmonton where the Predators generated only 12 shots, including three in the final period when they were supposed to have a "push" on to score. The highlight for the Preds continued to be the play of Pekka Rinne who was solid once again. Here is our game story and comments from the couch from last night. Josh Cooper had his game story, notes column, and postgame ponderings. Jim Diamond was in Edmonton and talked to Pekka Rinne who claims that the team has hit "rock bottom". From the blog world reports come from Ryan Porth, Amanda DiPaolo, Mark Willoughby, Jeremy Gover, Sam Page, Predatorial, and Lady Preds. Dirk also adds a morning look at the advanced stats from last night. The other side of the story comes from the Edmonton Journal, Edmonton Sun, The Copper and Blue, OilersNation, and Oil on Whyte. On a night when everyone at Rexall Place received a commemorative Ryan Smyth bobble-head, the honoree ended up with the game-winning goal in a 3-1 Edmonton comeback victory over the Nashville Predators. Smyth's third period goal led the comeback as the Preds were clearly out-skated and out-shot 25-12 against an Oilers team that was winning all of the battles at both ends of the ice. In the postgame TV interview Kevin Klein referred to the effort as "embarrassing" and gave all the credit to Pekka Rinne for keeping it close. Rinne stopped 22 of 24 shots that he faced while Nikolai Khabibulin was rarely challenged, stopping eleven of twelve Predator shots. Taylor Hall scored the Oiler's first goal and ex-Pred Ryan Jones got the empty-netter. Sergei Kostitsyn got the only goal for the Predators. The Predators will practice Tuesday morning at Rexall Place and then fly to Vancouver in the afternoon. The next game is Thursday at 9 p.m. CDT against the Canucks. After a 2-1-1 start to the season, it gets serious for the Predators starting tonight in Edmonton. This is the first time that the team has been on a real road trip this season. All the preseason games were same day out and backs and the trip to Columbus and St. Louis was a whirlwind with a regimented travel schedule. This week provides a "real" road trip with days off with a bunch of young players that have plenty to learn about life in the NHL. We took a look at the opportunity for team building in our preview earlier today and we are really curious to see what transpires over the next six days with games in Edmonton tonight, at Vancouver on Thursday, and then a matinee in Calgary on Saturday. Barry Trotz will learn a lot about his crop of youngsters on this trip and they will be exposed to new experiences too. After Saturday's game he said, "We are going on the road and we don't have the match-ups that you would want but we are just going to have to play to it." Other Previews of tonight's contest come from Amanda DiPaolo, Ryan Porth, Dirk Hoag, and The Tennessean. Ryan Porth has his audio preview with Jerred Smithson. From Edmonton check out Edmonton Journal, Edmonton Sun, The Copper and Blue, OilersNation, and Oil on Whyte. On Sunday, the Nashville Predators loaded up the plane and made the 1,755-mile trip to Edmonton, Alberta, which is the first stop on their three-city visit to Western Canada. The opportunity for the team to get out of town after a month of grueling preseason camp and nothing but short out and back, hectic road trips will provide a chance for the players to relax as a group away from the rink. With so many young players, it will be the first time that this year's version of the Predators will have to bond and work toward coming together as a cohesive bunch. It is a trip that the players look forward to that occurs twice a year. Several of the Predators are from Western Canada so it gives them a chance to play in front of their hometown friends. Last night's game between the Devils and Predators was a tale of two games. The Predators clearly were in control for the first part of the game and the Devils picked up steam toward the end. It was clearly the best effort of the season for the Predators at both ends of the ice. Barry Trotz was not displeased with the effort and appeared to find more positives than negatives after the loss. It is disappointing that critical points are decided in a mano-a-mano skills competition instead of with the teams on the ice. The team was scheduled to leave for Edmonton today at 1 p.m. where they will play the Oilers on Monday at 8:30 p.m.
After a 2-2-1 start to the season, Vancouver fans can watch this to bring a smile back to their face. Make the jump to see something that will make you happy. The Nashville Predators looked like a completely different team in their 3-2 shootout loss to the New Jersey Devils at a sold out Bridgestone Arena on Saturday night than they did in a lackluster performance in their opening night loss on Thursday against Phoenix. The team was back to playing their trademark "Predator hockey" with team defense and goaltending leading the way in a gritty, hard to play style that sends the opponent to the plane feeling the bumps and bruises levied against them both mentally and physically. Barry Trotz explained, "There was a lot more 'Predator hockey' there. We had a lot more detail, we battled harder. Unfortunately we didn't manage the game. If we had managed the game better, we would have had a win." Apologies for a technical breakdown on our standard postgame video of Barry Trotz's presser. Here is the audio instead. The Nashville Predators will meet the New Jersey Devils tonight at 7 p.m. CDT at the Bridgestone Arena in their only meeting of the season. It will be the Predators first meeting of the year against an Eastern Conference team in the young season. Both teams are 2-1 with the Preds losing their last one on Thursday to Phoenix 5-2 after winning their first two on the road last weekend. The Devils lost their opener to Philadelphia but won their last two, including a 2-1 shootout win over the Kings on Thursday. This is the Devils first game on the road this season. The Predators are banged up with Marty Erat, Mike Fisher, and Francis Bouillon on injured reserve and Patric Hornqvist being a game time decision with a "lower body" injury. It is a beautiful autumn day in Nashville that is perfect for fans to head out to the rink early for the plaza party that begins at 4:30 p.m. at the Bridgestone Arena prior to the Predators-New Jersey Devils match-up. Fans in attendance will receive the ever-popular magnetic schedule for your refrigerator. Puck drop will be shortly after 7 p.m. There is no local TV but the game is on the Center Ice Package with the home blackout lifted. We will have our game preview up shortly. 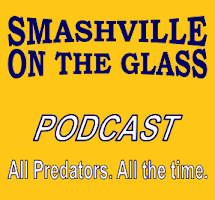 Pete Weber joined us for plenty of Predator talk on this week's Smashville on the Glass Radio show. Make the jump to use the player or go to the BTR site or iTunes to download. There is an old adage that things are never as good or as bad as they seem at a given time. It would definitely apply to the Predators' two-win road trip last weekend as well as last night's no-show at Bridgestone Arena. The team has had issues in all their games played this season but winning often masks underlying problems. Barry Trotz indicated that last night's game may help him get everyone's attention and I'm sure it will. To a man, the team is not satisfied with the issues that were present in the ugly loss to Phoenix last night with Shea Weber, Ryan Suter, and Barry Trotz all acknowledging that the team's play was not acceptable. Fortunately, the team will be back at it on Saturday at 7 p.m. with another home game against New Jersey with a chance to redeem themselves. Everyone is waiting to see what the "real" Predator team will look like as the season develops. Here is our Morning After round-up, our game story on Brian McGrattan, and postgame video with Barry Trotz. The Predators' "puck luck" caught up with them last night in a 5-2 loss to Phoenix, which was the Coyotes' first win of the season. Here is a round-up of stories about the game. Our game story was about Brian McGrattan's Predator debut. We also had Barry Trotz's postgame video. David Climer also covered the game and knew a stinker when he saw it. Jim Diamond uses Barry Trotz's word "whupped" to describe the game. David Boclair has his story at The City Paper where he says that result was "predictable." John Manasso has his take on the flat looking Preds at Fox Sports Tennessee while Preds.com has their usual coverage. From the blog world, reports come from Smashville 24/7, Amanda DiPaolo, Mark Willoughby, Jeremy Gover, Robby Stanley, Patten Fuqua, Dirk Hoag (with his advanced stats), Predatorial, Paul McCann, and Pred, White and Blue. Ryan Porth also has The Morning Skate. The other side of the story comes from Arizona Vibe, Five for Howling, Coyotes Examiner, the Arizona Republic, and the Coyotes Aggregator. Here is postgame audio from Jon Bum. From Phoenix comes Shane Doan (part two), Rostsilav Klesla, and Dave Tippett. After a hot 2-0 start on the road, the Nashville Predators took it on the chin at the Bridgestone Arena on Thursday night in front of a sold out opening night crowd of 17,113. The Phoenix Coyotes bested the Preds 5-2 on a night when little clicked for the home team. The Predators got behind the eight-ball early, going down 3-0 with Phoenix taking advantage of a slow reacting defense in the opening period. It didn't get significantly better but the Preds did get a short-handed goal from Ryan Suter in the second period and Colin Wilson's first goal of the season in the third. There were three players who played their first game with Nashville. Rookie Mattias Ekholm, Niclas Bergfors, and recent acquisition Brian McGrattan made their Predator debuts. McGrattan, the heavyweight, received the most praise from coach Barry Trotz. "McGrattan was a pleasant surprise. 'Grats' is a big guy that is very physical and gets around the ice pretty well." As we noted this morning, the Nashville Predators and Nissan Americas announced a multi-year partnership that will involve Nissan being named "the exclusive non-luxury import automotive partner of the Predators and Bridgestone Arena." Fans will notice a difference with signage in the main entrance, on one of the Zambonies, and elsewhere in the arena. The Broadway entrance will now be the "Nissan Entrance" and the main lobby will be the "Nissan Atrium." This agreement is one of several that the Preds have revealed in the past year that will add to the stability of the franchise and potentially could lead to a higher payroll in the future. 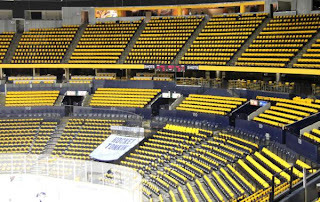 The Predators open their home slate tonight at 7 p.m. against Phoenix and all fans in attendance will receive a T-shirt, courtesy of Nissan. POTG Thursday Headlines, News, and Links: Roll Out the Gold Carpet! 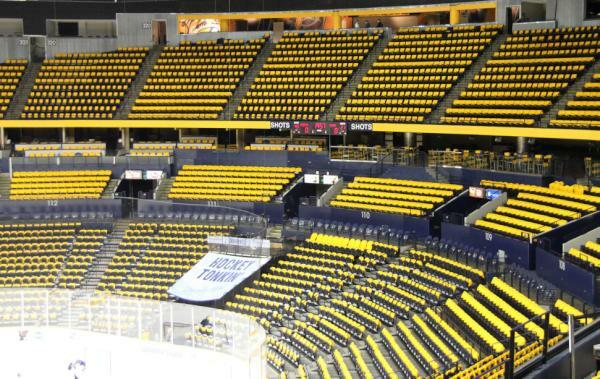 The Nashville Predators will roll out the "Predator Gold" carpet today at 4 p.m. at the Bridgestone Arena when players, dignitaries, and selected fans will walk into the arena to kick off the opening night activities in Nashville. There will be a party on the plaza and plenty of other activities for fans that arrive early. Puck drop will be shortly after 7 p.m. All fans attending the game will receive a T-shirt courtesy of Nissan. Here is a link for all the details of the festivities. Here is a link to our preview from earlier. More Pred-centric previews come from Amanda DiPaolo, Ryan Porth, Patten Fuqua, Robby Stanley, The Tennessean, Paul McCann, Dirk Hoag, Predatorial, Preds.com, Pred, White, and Blue and Lady Preds. It has been 157 days since meaningful hockey was played at the Bridgestone Arena. On Monday, May 9, 2011, the Nashville Predators took the Vancouver Canucks down to the final horn before losing 2-1 and ending the most successful post-season in franchise history. Tonight, the home season starts anew with the youngest team in the NHL against a Phoenix Coyote team that may have slipped a few notches since last year's playoff team. Puck drop will be soon after 7 p.m. once all the opening night color and pageantry is completed. Yahoo Sports Nick Cotsonika joined us for this week's episode of RLD Hockey Talk. We had a wide ranging conversation discussing all the current topics in the NHL as the season gets underway. We had heard earlier this morning that Zack Stortini had cleared waivers and now the Nashville Predators have announced that he has been assigned to Milwaukee. The move was made necessarily by the Predators picking up Brian McGrattan on waivers on Tuesday. It was almost like a Nashville Predator Day at the Hockey This Morning Show today with Mike Ross and Mick Kern. Pete Weber and Colin Wilson both appeared for segments. For those without the satellite radio, here are the links for Weber and for Wilson audio clips. POTG Wednesday Headlines, News and Links: The Big Bad Preds? Yesterday, the Predators made a couple of roster moves, waiving Zack Stortini and picking up Brian McGrattan on waivers. In a true oddity, there was a dearth of local media at practice so there was no one there to grab a quick quote on why the move was made and throw it up on Twitter. David Boclair eventually came up with the quote from David Poile after practice. Below, we have speculation on the reason for the move from Dirk Hoag and a feature on Stortini from Amanda DiPaolo. When the move was made, a Nashville hockey writer message board had a variety of speculation on the reason for the move. My take was a little different than the others. Looking at David Poile's track record, he is always ready to make an upgrade at any position if the opportunity arises and the price is right. That is exactly what happened here. Stortini had done everything that was asked of him and did a great job but the role he was placed in was being the team enforcer and keeping the mean guys on the other team away from the hoard of Predator youngsters. Stortini also had enough hockey skill to play regular shifts when needed. While Stortini played the role well, he's not the type of guy that keeps enforcers from other teams awake at night knowing who they will face in a bout the next night. Brian McGrattan is that type of guy. McGrattan is huge, standing 6'4" and weighing in at 235. He holds the all-time season record of 551 penalty minutes that he amassed in the 2004-05 season with Binghamton in the AHL. He has not been in the NHL in a couple of years but he is no less mean. His mere presence in the lineup is enough to keep other teams from taking cheap shots at Craig Smith and the other youngsters. He may not play as many shifts as Stortini, but if you want an enforcer on your team, why not have the biggest, baddest guy in town. That's what the Predators have now. In somewhat of a surprising move, the Nashville Predators claimed Brian McGrattan off waivers from the Anaheim Duck this morning. It is a curious move since the Predators are at their maximum roster of 23 players with Mike Fisher and Francis Bouillon expected to return soon. McGrattan has been a tough guy which has been the role of Zack Stortini so far in the season. It will be interesting to see what further moves are made. Update: Multiple sources are reporting that Stortini was placed on waivers today. Tuesday Headlines, News and Notes: Is Three on Three the Future of OT? Lat night's overtime fiasco between Tampa Bay and Washington was a sight to behold. It was the last game played and had the attention of the entire hockey world with a Versus audience. The overtime period featured an unheard of three penalty calls and resulting power plays. The three on three play for 58 seconds was great with plenty of open ice. With all this, no goals were scored. It took a skills competition to decide the game but the brief period of three on three did offer hope for the potential future when after five minutes of four on four in overtime, three on three play would offer a better ending than a shootout. Hopefully, at some point, after enough Research and Development Camps, the NHL powers that be will agree. The Nashville Predators will feature a special "Predator Gold" carpet for all the arriving players and dignitaries for opening night on Thursday. The carpet walk begins at 4 p.m. and will be followed by a full out party on the plaza. Puck drop will be at 7 p.m. and all fans in attendance will receive a T-shirt courtesy of Nissan. The fun continues Saturday, when the Preds play the New Jersey Devils at 7 p.m. and all fans will receive the ever popular O' Charley's magnetic schedule. There will also be another party on the plaza starting at 4:30 p.m.
Limited tickets for both nights are still available. Happy Thanksgiving to all of our Canadian readers and Happy Columbus Day to those who are celebrating with a day off in the States of which I am not one. There are four games this afternoon to give us worker bees hockey to listen to while we toil. It was the biggest of days in Winnipeg with the return of the Jets. While the team lost on the ice, it was still a victory for the Winnipeg NHL fans. Illegal Curve has all the details. Gary Bettman even received a rare positive reception in the city. The Preds are looking good, sitting atop the Western Conference after going 2-0 on the road against key Central Division rivals. Here is our round up from Saturday's win in St. Louis as well as Friday night's win in Columbus. It's a pretty safe bet that the Nashville Predators will not go undefeated this season but the 2-0 start on the road has been impressive. Including the preseason, they have won eight games in a row and have done it with contributions throughout the line-up. Preseason questions about the David Poile's reliance on youth appear to have been answered in the first two games with Craig Smith leading the league in most rookie categories through two games. He won't continue at the same two point per game pace but he has not been over-matched against two fairly large teams. The defense has looked solid in spite of the third pairing of Jack Hillen and Teemu Laakso being over-matched at times with opposition coaches trying to put their top scoring lines against the when possible. If Ryan Suter and Kevin Klein continue to jump up on offense it should open opportunities for plenty of others as teams will not be able to lay off of them as scoring threats. Miraculously, in the offseason, a whole crop of folks have learned that hanging out around the net can lead to rebound goals and it has paid off so far. That has played a big part in a rejuvenated power play and the penalty kill has not missed a beat from past successes. After an off day today, the Preds will return to practice on Monday and continue to sort out their roster situation which continues to be fluid with an injury to Marty Erat and Mike Fisher and Francis Bouillon getting closer to a return every day. The Nashville Predators moved to 2-0 on the young season with a 4-2 victory over the Blues at the Scottrade Center in St. Louis on Saturday night. David Legwand figured in on all of the Predators scoring with a four point night with two goals and two assists. His line-mates also had big nights with rookie Craig Smith scoring his second goal in his second game as a pro and also added an assist while Colin Wilson played a solid game and added an assist. Kevin Klein was responsible for the game winner with a rare goal that came just 57 seconds after Jason Arnott had tied the game 2-2 midway into the final period. The Blues other goal came from Patrik Berglund at 7:44 in the opening period. Pekka Rinne out-dueled Jaroslav Halak, stopping 31 of 33 Blues' shots. The Preds only mounted 16 shots but three made it past Halak, while the final one was an empty netter by Legwand. The Predators were two of four on the power play while yielding a goal on five penalty kills. The Predators returned home after the game and will not play again until the home opener against Phoenix on Thursday. The Nashville Predators will return to the ice tonight at the Scottrade Center in St. Louis and hope to make it two in a row in an unusual scheduling situation where the team opened with back to back games on the road against divisional opponents, a first in franchise history. Last night's 3-2 win over Columbus was pure "Predator hockey" with Pekka Rinne starting his chase for the Vezina in a solid effort, a strong defensive effort, and just enough scoring to win. The NHL is back and almost in full swing today with two games in Europe and eleven in North America tonight. Sunday features two games including the NHL's return to Winnipeg at 4 p.m. CDT (NHL Network). It is a party that has been years in the making is going on in Winnipeg as the Jets officially return. Illegal Curve has the rundown for all the day's events on Sunday. The Predators started off well in Columbus on Friday with a 3-2 win. Here is our game story and Morning After round-up. We will have our preview of the Preds game in St. Louis up shortly. Due to scheduling conflicts, we had this weeks Smashville on the Glass Radio show Thursday night with Amanda DiPaolo and Jeremy Gover joining Ryan Porth and me for a look at the Predators on the eve of the new season. It was a lively discussion with plenty of opinions as to where the team was headed. Last Night's opening game 3-2 victory for the Predators could not have been scripted any better as an example of Predator hockey. Excellent goaltending, solid defense, and just enough scoring to eek out a one goal victory is almost the definition of "The Predator Way." The fact that it came on the road in Columbus against a Blue Jacket team that is improved has already made the current two game road trip a success. A win tonight in St. Louis would make an even bigger statement that the Predators have picked up where they left off at the end of last season when they were playing as well as anyone in the Western Conference. The Nashville Predators picked up where they ended the preseason, beating the Columbus Blue Jackets 3-2 at Nationwide Arena on Friday night. Matt Halischuk's backhander, 39 seconds into the third period was the eventual game winner. Ryan Suter and Craig Smith had the first two Preds' goals. Vinny Prospal and Rick Nash scored for the Jackets. Pekka Rinne picked up the win, stopping 32 of 34 shots, while Steve Mason gave up three goals on 31 Predator shots. The Preds converted a goal on three chances on the man advantage while holding Columbus scoreless on five power plays. It was a typical Preds-Jackets game with plenty of chippy play and close checking in a back and forth game. The game ended with a scramble in front of the Predator net with bodies all over the ice trying to cover the puck in the last few seconds. The Predators left immediately after the game and will play the Blues in St. Louis on Saturday night at 7 p.m. Here are the post game notes from Columbus and audio clips from Coach Scott Arniel, Rick Nash, and Vinny Prospal. Barry Trotz now has a winning record in opening games, moving to 7-6 with the victory. The Preds continued their net crashing with aggressive play around the net with Spaling, Halischuk, Hornqvist, Wilson, and O'Reilly all camping out around the net looking for rebound goals. Shea Weber knocked Steve Mason's helmet off with a shot from the blue line midway through the second period. Rick Nash really went down easily drawing a penalty when Smithson touched his skates in the third period. Prospal hit a post in the third period that could have easily gone in off of Rinne had it not been for a favorable bounce. On the other end, Craig Smith got a pipe at 3:38 in what could have been his second goal. Jerred Smithson missed a chance at an empty netter with when he committed a turnover near the Columbus net. The Predators Wisconsin connection provided two goals and an assist with Suter and Smith picking up goals and Suter also adding an assist. Smith tied for the most shots with five along with Shea Weber and Nick Spaling. Jackets fans had to be happy with Jeff Carter's and Vinny Prospal's first games in Columbus as Prospal had had a goal and an assist and Carter had two assists. Rick Nash also had a two point game with a goal and a helper. The Predators new third defensive pair, Hillen and Laakso, each took penalties in the game while playing 23 shifts and each had a shot. The Predators struggled in the faceoff circle, winning 30 and losing 43 for a 42% win total. Mike Fisher was given the team's second "A" before the game but Marty Erat donned it during the game as Fisher remains on Injured Reserve. Scratches for game one were Zack Stortini, Niclas Bergfors, and Mattias Ekholm. It was somewhat surprising that Stortini sat since Columbus always seems to resort to fisticuffs. Half of "Blogger's Row" attended the game on the 303 Bus Trip with Amanda DiPaolo and Patten Fuqua sitting in the press box while Jeremy Gover sat with the fans. Check Inside Smashville and Puck Scene for post game quotes from the locker room. Last night, as the clocked ticked toward midnight (CDT), Evgeni Malkin skated toward Roberto Lunongo with the puck on his stick in a skills competition and lifted it past the sprawling goalkeeper to lead the Pittsburgh Penguins to a 4-3 win over the Vancouver Canucks and you knew that hockey was back. It was the last game of three for the night after Philadelphia has spoiled Boston's opening night banner raising celebration with a 2-1 win and Toronto had surprisingly shut out the Habs with a 2-0 victory where ex-Pred Matthew Lombardi scored the game winning goal and James Reimer pitched a shutout. The action picks up early today in Europe with Anaheim and Buffalo and the Rangers and Kings playing at noon CDT. Tonight, the Predators play at Columbus and here is our preview from earlier. The puck drop is at 6 p.m. and will be on FS TN. The Nashville Predators left yesterday on a two game road trip to Columbus and St.Louis which is not that unusual. It is different in that the Preds are starting with back to backs on an opening weekend against two teams that want to move past Nashville in the standings this season. The Preds have never opened against the rival Blue Jackets. Columbus appears fortified and ready to play. In the offseason, they picked up Jeff Carter, Vinny Prospal, and James Wisniewski (who is currently suspended). They are also banking on Steve Mason rebounding to play like he did as a rookie when he won the Calder Trophy. ...And, as always, they hate the Predators. Columbus has viewed Barry Trotz and the Predators as "The Evil Empire" and tried to make the likable Preds into a villain from the South. The Preds are not "evil" even though Trotz admitted that he scared children occasionally last year. The Blue Jackets and Preds have had a bitter rivalry where Nashville has frustrated Columbus, more often than not over recent seasons. Since 2006-07 the Preds are 10-5-1 at Nationwide Arena. Games have been close, with seven of the last eleven meetings going to overtime or a shootout. While the Preds are not evil, they are consistent. The Preds bring the same game every year with solid goaltending, a strong defense, and just enough offense to win. This year may be different. Granted, it was the preseason, but the Preds averaged over three goals per game and were over 21% on the power play. Since the start of camp, Trotz and company have emphasized shooting the puck. The difference is that younger players have infiltrated the team that don't understand a "pass first" mentality. The Predators are very young and extremely deep with up to 30 players that are perceived by management as NHL ready. Seventeen of the 25 players on the opening day roster were drafted and developed by the Preds and understand the system well. Last week, before the final cuts, I asked Barry Trotz about this year's team and the depth players that could play in the NHL. "I don't know if it's the best squad we've had in camp. In terms of overall work ethic, I can say that (it is). In terms of overall talent and skill, we've had teams that had more skill at times, but they weren't better teams." Trotz laid out the plan,"We want to be hard to play against and harder to beat. That's the way we're going to have to be. The Western Conference is so tough. Everybody has gotten better by adding pieces." "We've gotten better in a more quiet way. Craig Smith will be able to help us. The young defensemen will be able to help us as they mature. I don't think we have ever had goaltending like we have with Peks and Lindy so we are ready for the long haul." "It's not going to be easy. Hopefully, we'll add Mike Fisher and Frankie Bouillon to the fold and we'll be in good shape. We're pretty deep." That's the "Predator Way." It's never easy, and other teams always wonder why they lost after the game. It's time to drop the puck and play some Predator hockey. This week on the RLD Hockey Talk Podcast we had Craig Custance from ESPN and Dennis Bernstein from The Fourth Period on to help us preview the NHL Western Conference. Craig gave us insight into the tough Central Division while Dennis took on the equally competitive Pacific Division. Ryan and I finished off the show with our take on the Northwest Division. Over the last couple of days I've managed to make several folks mad with my picks in the Eastern Conference and Western Conference so today I'll continue the irritation with my playoff picks and choices for the NHL Awards. POTG Opening Day Headlines, News and Links: It's Finally Time to Drop the Puck! Hockey fans, today is the day we've all been waiting for since the night in June when Boston defeated Vancouver in game seven to put the bow on the 2010-11 NHL season. All thirty teams are undefeated and 29 of them are hopeful that this season will bring better fortunes to their team than the year before. Action gets underway tonight with Philadelphia at Boston (Versus, 6 p.m. CDT), Montreal at Toronto (6 p.m. Center Ice Package), and Pittsburgh at Vancouver (Versus, 9 p.m.). Friday will see six games that includes two in Europe and Nashville opening at Columbus. Almost everyone is underway by Saturday with a slate of 13 games including the Preds second game in St. Louis. Nashville fans will have to wait until Thursday, October 13 for Phoenix to come to town for the Predators' home opener. We have had our Eastern Conference and Western Conference picks the last two days and will give our playoff picks and NHL Award projections in just a little while. Where Will Mattias Ekholm Play This Season?